Marketing is the most effective tool for the smooth running of any business. All these days business made use of traditional marketing tools and but it is no more limited to that. Nowadays, after the evolvement of the Internet entrepreneurs are conducting their business online. Online marketing is not a piece of cake! People will have to plan a perfect strategy in order to market a business online. There are varied types of online marketing tools that are available these days. The effective use of these tools will help in successful marketing of a business on the online platform. 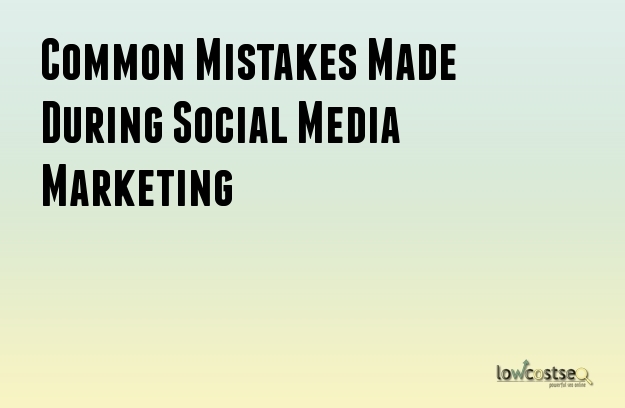 However, there are many entrepreneurs that are constantly making various social media marketing mistakes. This is the reason why they are unable to market their business online. So, what are those mistakes that are being made by some entrepreneurs? Here is a detailed description of them. Entrepreneurs who do not plan an effective social media strategy can never achieve their social media marketing goals and reach out to their targeted customers. Thus, it is important to plan an effective social media marketing strategy. In the strategy, one must include conceptualized goals, media voice, setting up policies for social media and above maintaining a calendar for social media. Most of the businesses are in the habit of creating too many accounts on various social media platforms. Most of the companies are unable to deliver quality contents for engaging their customers. This is the reason why they fail in their social media marketing strategy. The inability to create quality contents on a regular basis forces them to keep outdated posts for a longer time. This creates a negative impression in the mind of the customer, as they feel the company is disorganized. Having millions of fan followers is a good sign for the business as they help the business to build their brand reputation. However, it is important for businesses to keep a hawk’s eye on spam or fake followers as they will not help in increasing the ROI or return on Investment of the company. The aim should always be to gather and build a relationship with genuine customers. Displaying and talking about the company brand name is important, but doing too much of anything is never effective. Companies should talk about their brand and write contents concerning their brand, but it is important to also have general and friendly conversation with their customers. This will certainly help in drawing the customer’s attention and keeping them engaged on a regular basis. It is a known fact that using of hashtags can be beneficial for any business. However, it is important to keep a note that excessive use of hashtags can be very irritating and annoying. Hashtags help to increase the visibility of important points. Thus, make limited use of hashtags so that you can only highlight the points that are crucial for your business.